We teach foreign languages in order to bring to our students the intellectual, personal and cultural benefits of learning new means of communication. Students, in learning a language, come to understand the structure underlying all language, including their own. Language study increases mental agility and leads to growth in one’s powers of reasoning, memory and creative thinking. Language study allows one to go beyond oneself to experience the new and different, and to courageously confront and surpass personal limitations. It nurtures adaptability and openness. Through the medium of language, students come to know and appreciate the richness of other cultures in our increasingly interdependent world. By encouraging the free exchange of ideas, the development of articulate expression, and the incorporationof both contemporary and time-tested thinking in other languages, we help equip our students to learn from the past, to participate in the complex world of today, and to shape the future. In 5th grade Chinese concentrates on speaking aspect of language learning. Students will grasp vocabulary about themes such as color, body part, family member, number, animal, calendar and such. They also will learn a lot of Chinese songs and rhymes. Radicals and simple character writing will be introduced. Chinese culture is celebrated through arts, field trip, cooking activities and many other ways. This course continues to focus on speaking aspect of language learning. Themes include food, household, clothing, time, money and places, such as a school, post office, hospital, shop and more. Chinese phonetic system, pinyin, will be formally introduced. Writing will still involves simple characters. Chinese culture is celebrated through songs, arts, movies and many other ways, with a focus on food. Students in 7th grade Chinese balance reading and speaking aspects of language learning. Students will learn situational dialogues, between a patient and a doctor, between a shopper and a salesperson, between a teacher and a student, and so on. Students will start to write characters that match the theme vocabulary. Grammar will be officially introduced. Chinese culture is celebrated through songs, arts, movies and more, with a focus on Chinese holidays. In 8th grade Chinese will start to balance all aspects of language learning, including speaking, listening, reading and writing. Themes include visiting a library and gallery, renting and buying houses, travel and transportation. Students will learn to write short dialogues, as well as paragraphs to describe things and experiences. Grammar and writing start to take on more weight. Chinese culture is celebrated through songs, arts, movies and many other ways, with a focus on Chinese painting and music. What was Medieval France like? How does it compare to life in Western New York in the 21st Century? In 5th grade, students study medieval England in their Central Studies (CS) program. We will support their CS work by looking at life in medieval France. We will specifically learn French terms for parts of a castle. We will watch the movies, “Les Visiteurs,” “Beauty and the Beast” (Cocteau), and selected excerpts from the film, “The Black Knight.” We’ll also study Guillaume le conquérant from the Norman perspective. What are the qualities of French heroes and heroines? Astérix, Vercingétorix, Jeanne D’Arc, Napoléon, Charles de Gaulles, Les justes (French men and women who protected Jews during World War II), and members of La Résistance are accepted as French heroes. We are going to compare Americans and French values with regards to the qualities they impart on their heroes. What personal characteristics are valued in French history? When and why does French history connect with North America? We will discover Roman France, medieval engineering marvels, Louis XIV, Marie‑Antoinette, the Declaration of the Rights of Man and Woman [Olympe de Gouges]), Normandy and D‑Day through their history, architecture and cuisine. How do students represent a culture with empathy through theater? How do they convey a culture’s gestures, clothing, attitude, language, and experience in the role of a character? Acting in French helps to convey history and culture, while students improve in accent and fluency through performance. Part of the class includes films from modern francophone countries. In Middle School Latin, students explore the foundations of Western civilization and examine how antiquity - the world of the ancient Greeks and Romans - has shaped modernity, particularly in the areas of language, literature, law, science, medicine, government, architecture, urban planning and even the very way that we think. Learning through games, projects, songs and skits, along with traditional methodology, is employed at the Middle School level. In 6th grade, the students explore the foundation of western civilization through language, culture, geography and history. The children concentrate on the Latin language, the history and culture of the Roman world, and its continued relevance to our world today. The students also study the ancient Greek world, learning the alphabet, Greek root words, along with history and culture. We end our adventure with a study of Greco‑Roman mythology, which incorporates vocabulary learning, in conjunction with the engaging stories associated with the gods and goddesses. Along with language learning, this course also concentrates on the process of second language acquisition. Students explore their individual learning styles and develop strategies to assist them in learning Latin. These strategies also help the students in other courses. In 7th grade, students begin their formal study of the mechanics of the Latin language. Although primarily textual, the course is taught using the four skills language approach: reading, writing, speaking and listening. The grammar taught in Latin strengthens the students’ English grammar skills, and the students increase their English vocabulary by learning derivatives that come from Latin roots. Learning the vocabulary and grammar of Latin also strengthens students’ general language learning techniques, along with their reasoning and analytical skills. Along with language learning, this course concentrates on the process of second language acquisition. Students explore their individual learning styles and develop strategies to assist them in learning Latin. These strategies also help the students in other courses. In 8th grade, the students continue their exploration of Latin grammar, vocabulary and derivatives, and translation, along with culture, history and mythology. The students also explore areas of individual interest and/or complete interest based projects. 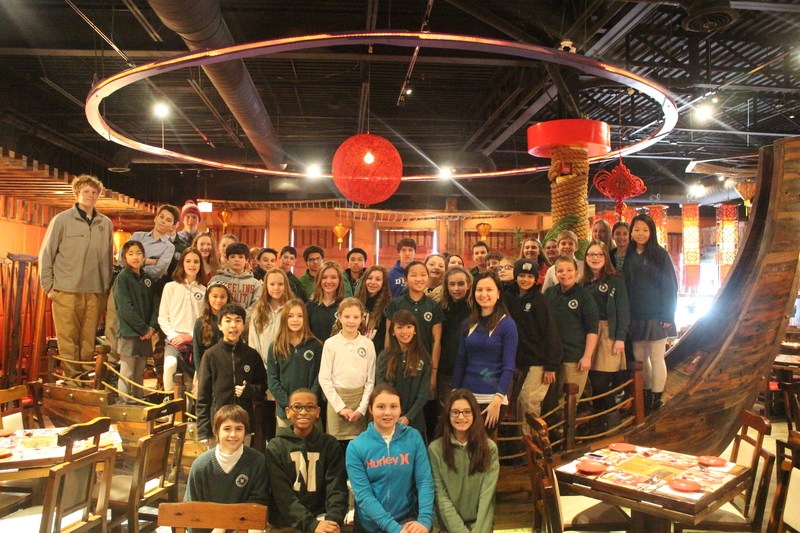 In March, the 8th grade students participate in the National Latin Exam, a worldwide competition. Along with language learning, this course also concentrates on the process of second language acquisition. Students explore their individual learning styles and develop strategies to assist them in learning Latin. These strategies also help the students in other courses. At Nichols, the language journey begins in 5th grade. Here the students begin building the basics of the Spanish language, which they will continue to study for the next 4 years. They will be using the textbook, “¿Cómo te va?” The overall objective of the 5th grade Spanish class is to give the students a solid foundation in pronunciation and to acquire basic vocabulary. The students are encouraged to use simple phrases and expressions to communicate their needs on a very basic level, and talk about things that relate to their daily lives. Videos, songs, games, storytelling and computer programs are used to further the students’ knowledge of the language and culture. Sixth grade curriculum is a continuation of the 5th grade program, which was based on the “¿Cómo te va?” series. Students continue to expand their vocabulary and conversational skills. They learn about the culture of different Spanish speaking countries and are introduced to a variety of grammar concepts of the Spanish language. Computer programs, stories, games, skits, songs and visual aids continue to be important, but written work is added. Students are expected to learn and review vocabulary and grammar on a daily basis. Constant practice is a key to mastering the language. At the beginning of the 7th grade course, students review some of the material covered in 6th grade and then move on to learn the material covered on the first four chapters of the “Descubre” textbook. During the 7th grade course, the fundamentals of oral and written skills are emphasized. Vocabulary and grammar usage are strengthened through daily reading, writing and listening, and through constant review of the class material. Eighth grade curriculum is a continuation of the 7th grade program, which was based on the “Descubre” series. During the first trimester, the students review some of the materials covered in 7th grade and then learn the material covered in chapters 5 through 9 in the “Descubre” textbook. The students will finish Level 1 by the end of 8th grade, and will have activities to develop their skills in listening, speaking, reading and writing. Through a variety of projects, skits and written works, students practice the language and learn about cultural aspects of Spanish speaking countries. They are expected to use their vocabulary knowledge and correct grammatical structures to communicate in real life situations. They will learn the present tense, both regular and irregular verbs, and preterite tense by the end of the year. The goal of the 8th grade Spanish class is to prepare students for a smooth transition to the Level 2 Spanish in the Upper School.